A substantial number and share of older Americans are living in “multigenerational” households, according to our analysis of recently released 2015 American Community Survey (ACS) one-year population estimates. In total, 20.3 percent of all non-institutionalized adults aged 65 and over – about 9.4 million people – live in multigenerational households that include at least two generations of adults (individuals over the age of 25). The ACS data also show large differences in the prevalence and composition of multigenerational homes by age, race, and ethnicity. The new data not only reflect the fact that there are a growing number of older Americans, but also that the share of older Americans living in multigenerational homes has been growing steadily since the 1980s. These trends are likely to continue as baby boomers age. Importantly, multigenerational living might allow some older Americans to enjoy a higher quality of life while aging in place, as an overwhelming majority of people want to do. At the same time, for some families of limited means, multigenerational living may be a financial necessity rather than a desirable living situation. Regardless of why they are choosing multigenerational living arrangements, providing families with education and support to suitably modify their homes could help these arrangements be as safe, effective, and beneficial as possible. 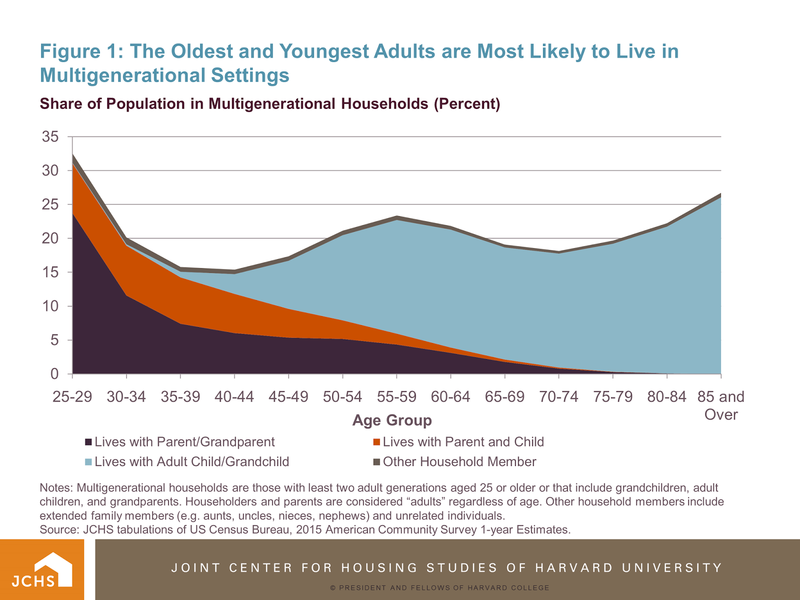 Who Lives in Multigenerational Homes? About two-thirds of the 9.4 million older adults living in multigenerational homes live in households that have exactly two adult generations (usually parents and adult children aged 25 or older). The rest are in three-or-more-generation households that typically include grandparents, adult children, and grandchildren. 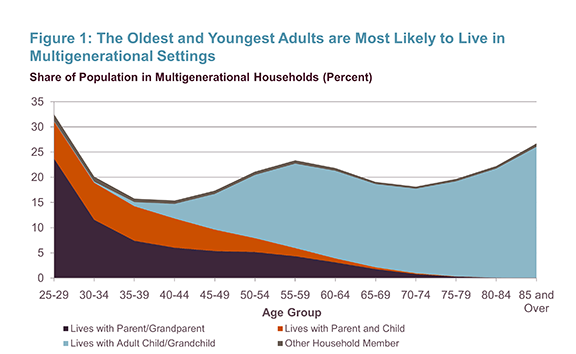 Trends in multigenerational living also change with age (Figure 1). The share of people living in multigenerational settings is highest for individuals in their late 20s (mostly due to adult children still living at home), then drops for those in their 30s as young adults move out and form their own households. The share rises again for people in their early 40s until peaking at about 23 percent for people in their late 50s. This “sandwich” age group includes people who are living with their adult children, those who are living with their aging parents, who often need daily support and care, and those living with both their children and aging parents. Notes: Multigenerational households are those with least two adult generations aged 25 or older or that include grandchildren, adult children, and grandparents. Householders and parents are considered “adults” regardless of age. Other household members include extended family members (e.g. aunts, uncles, nieces, nephews) and unrelated individuals. Source: JCHS tabulations of US Census Bureau, 2015 American Community Survey 1-year Estimates. Because adult children move out and elderly parents pass away, the share of people living in multigenerational households declines for people who are in their 60s and early 70s. However, the share rises steadily for older adults in their mid-70s, who often are starting to face more daunting health and financial challenges. Among the oldest age groups (aged 85 and over), 27 percent – about 1.5 million people – lived in multigenerational households in 2015. 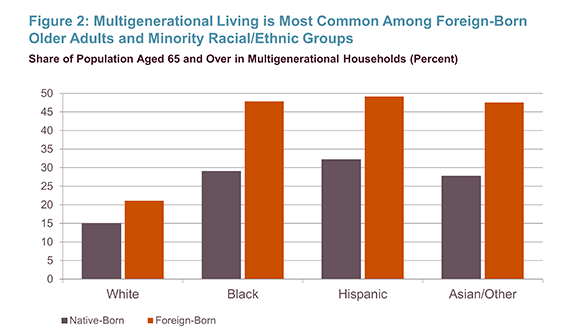 In addition to differences in age, people of color and foreign-born individuals are far more likely to live in multigenerational settings than non-Hispanic whites and people born in the United States (Figure 2). 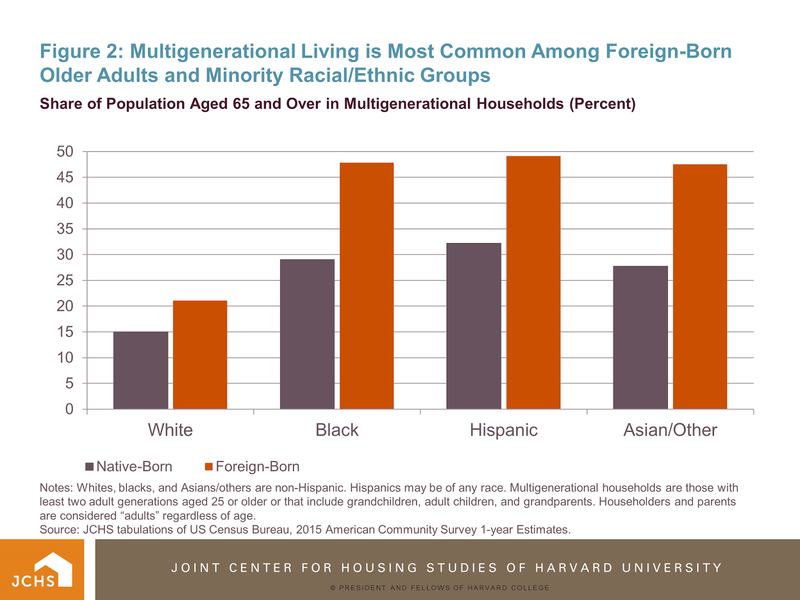 More than 25 percent of native-born blacks, Hispanics, and Asians/others aged 65 and over live in multigenerational homes, as do more than 45 percent of foreign-born in all three of these groups. In contrast, 15 percent of native-born non-Hispanic whites of the same age, and just over 20 percent of foreign-born non-Hispanic whites, live in multigenerational households. Notes: Whites, blacks, and Asians/others are non-Hispanic. Hispanics may be of any race. Multigenerational households are those with least two adult generations aged 25 or older or that include grandchildren, adult children, and grandparents. Householders and parents are considered “adults” regardless of age. Source: JCHS tabulations of US Census Bureau, 2015 American Community Survey 1-year Estimates. A sizeable subset of these multigenerational homes include at least three generations: usually grandparents, adult children, and grandchildren living together under the same roof. Roughly ten percent of native-born blacks, Hispanics, and Asians/others aged 65 or over live in such households, along with around 25 percent of foreign-born older adults in each group. Among non-Hispanic whites, just under 4 percent of older native-born adults and 7 percent of the foreign-born live with three or more generations. 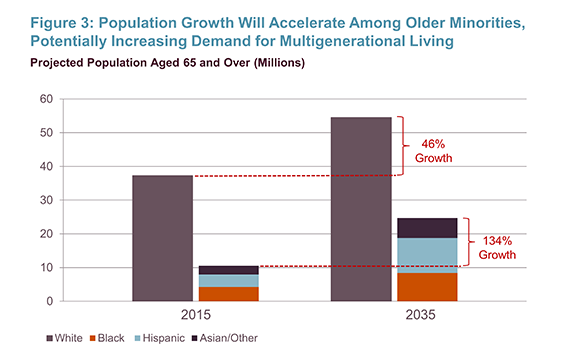 Looking forward, projected growth and demographic shifts in the older population seem likely to increase the number of multigenerational households and the share of people living in those households. The U.S. Census Bureau’s most recent population projections estimate that by 2035, about 79 million Americans will be age 65 or older, an increase of more than 30 million people in just two decades. This growth is due to the fact that the baby boom generation is getting older and because with increases in longevity more people will live well into their 80s, 90s, and beyond. In fact, the Census Bureau projects the number of “oldest old” adults aged 85 and over to double over the next two decades. The racial and ethnic composition of the older population will also shift markedly over the next several decades. The non-Hispanic white share of the 65-and-over population is projected to drop nearly ten percentage points to 69 percent by 2035, while the black, Hispanic, and Asian shares will rise, respectively, by 20 percent, 67 percent, and 39 percent (Figure 3). Census Bureau projections estimate that the foreign-born share of the 65 and over population will also continue to increase, growing from 13 percent in 2015 to 19 percent in 2035. 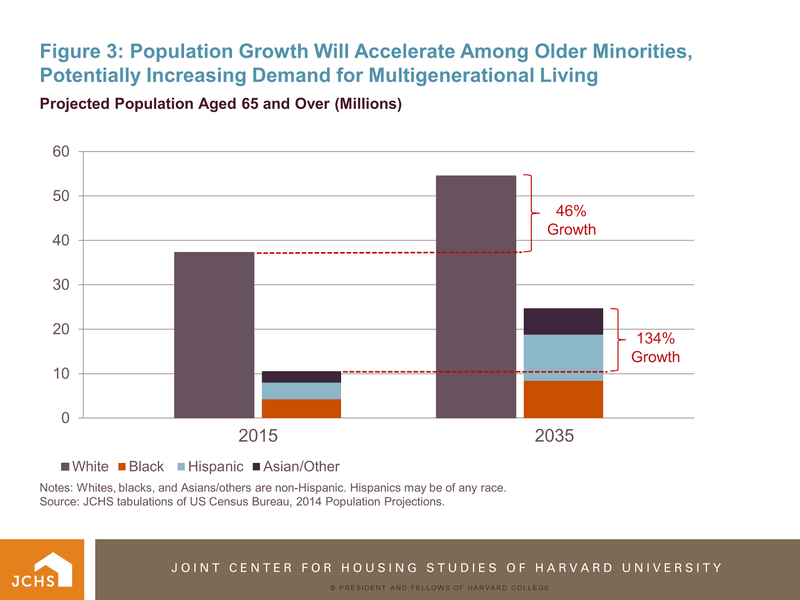 Though the direction of future residential preferences among the older population is uncertain, the sheer magnitude of growth in the older population and the fact that much of the growth will be among the very old, people of color, and the foreign born suggests there will be substantial growth in multigenerational households in the coming years. Notes: Whites, blacks, and Asians/others are non-Hispanic. Hispanics may be of any race. Source: JCHS tabulations of US Census Bureau, 2014 Population Projections. As this growth occurs, it will be important to consider how new and existing housing stock might be designed or modified to best meet the needs of multigenerational households. Universal design features including single-floor living, zero-step entrances, and hallways and doorways wide enough to accommodate wheelchairs, walkers, or strollers can make homes more accessible for older adults with mobility limitations as well as for their young grandchildren. Flexible layouts that can change as family needs evolve, as well as the addition of semi-private spaces for each generation (such as in-law suites with separate entrances, multiple master bedrooms or kitchens, and accessory dwelling units), can also help make the housing stock better suited for multigenerational households. While multigenerational living works well for many households, it is important to note that it is not necessarily a desirable option for every family. Rather, multigenerational living may be a financial necessity rather than an attractive housing option not only for families with lower incomes but also for moderate-income families living in higher-cost areas. Further, sharing a home with multiple generations can be challenging, particularly if the house is small, has inadequate amenities, or there are unclear or unrealistic expectations about responsibilities for both finances and personal care. Finally, informal help from family members may not be an adequate replacement for professional care, particularly for aging adults with serious health conditions. Providing families with guidance about how to live successfully in multigenerational settings, and, perhaps, with financial assistance to make home upgrades and modifications, will therefore be critical if multigenerational living is going to be an appealing, comfortable option for families of all means. While designing and carrying out such policies and programs will be challenging, such efforts have the potential to provide a more appealing and cost-effective housing option for older Americans and their families.